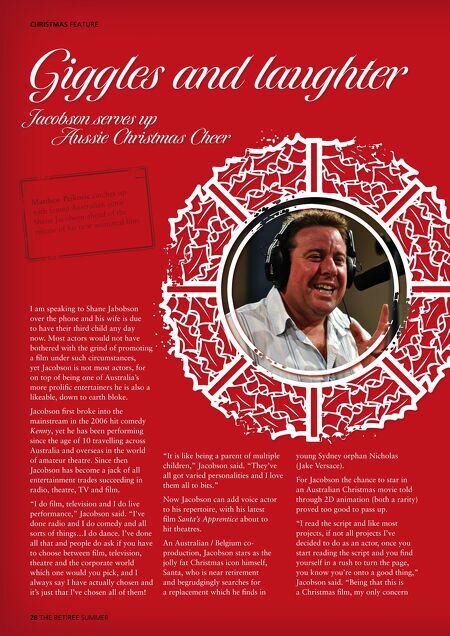 CHRISTMAS FEATURE Giggles and laughter Jacobson serves up Aussie Christmas Cheer I am speaking to Shane Jabobson over the phone and his wife is due to have their third child any day now. Most actors would not have bothered with the grind of promoting a fi lm under such circumstances, yet Jacobson is not most actors, for on top of being one of Australia's more prolifi c entertainers he is also a likeable, down to earth bloke. Jacobson fi rst broke into the mainstream in the 2006 hit comedy Kenny, yet he has been performing since the age of 10 travelling across Australia and overseas in the world of amateur theatre. Since then Jacobson has become a jack of all entertainment trades succeeding in radio, theatre, TV and fi lm. "I do fi lm, television and I do live performance," Jacobson said. "I've done radio and I do comedy and all sorts of things…I do dance. I've done all that and people do ask if you have to choose between fi lm, television, theatre and the corporate world which one would you pick, and I always say I have actually chosen and it's just that I've chosen all of them! 28 THE RETIREE SUMMER "It is like being a parent of multiple children," Jacobson said. "They've all got varied personalities and I love them all to bits." 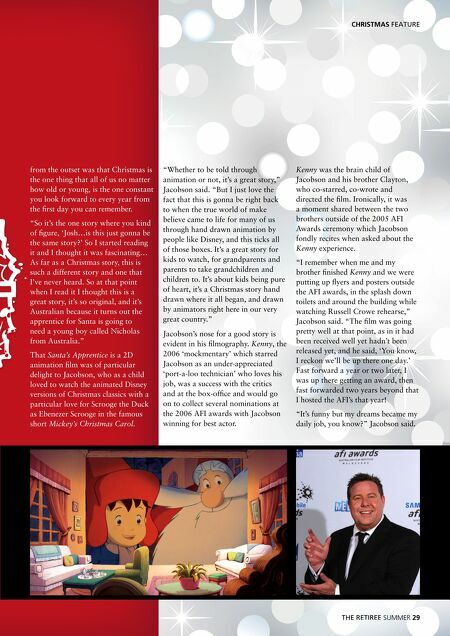 Now Jacobson can add voice actor to his repertoire, with his latest fi lm Santa's Apprentice about to hit theatres. An Australian / Belgium co- production, Jacobson stars as the jolly fat Christmas icon himself, Santa, who is near retirement and begrudgingly searches for a replacement which he fi nds in young Sydney orphan Nicholas (Jake Versace). For Jacobson the chance to star in an Australian Christmas movie told through 2D animation (both a rarity) proved too good to pass up. "I read the script and like most projects, if not all projects I've decided to do as an actor, once you start reading the script and you fi nd yourself in a rush to turn the page, you know you're onto a good thing," Jacobson said. "Being that this is a Christmas fi lm, my only concern Matthew Pejkovic catches up with famed Australian actor Shane Jacobson ahead of the release of his new animated fi lm.